RATES: Fivethirteen has daily rates* and hourly rates for guest engineers if this method is preferred. Our daily rates include an engineer and are the same regardless of which room is booked, or which medium you're tracking to or mixing from. 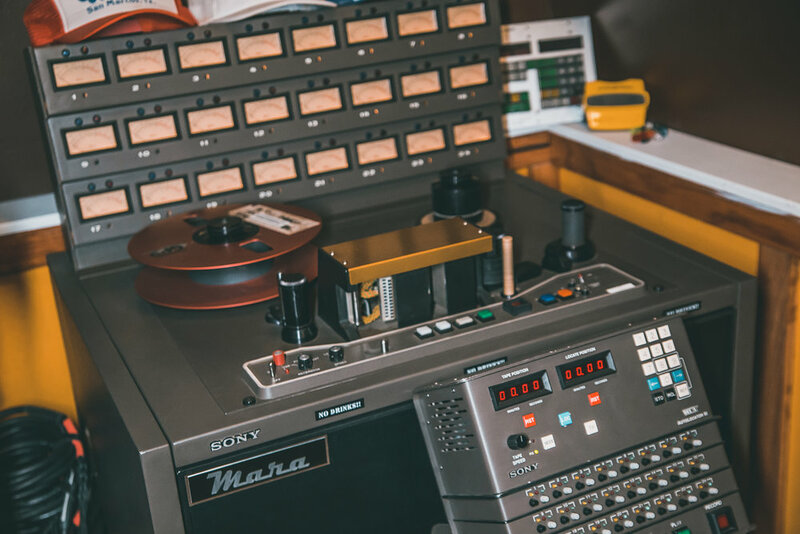 If you book a tape session, you are responsible for purchasing your own reel(s), and we will provide you with the information to do so. We accept cash and all credit or debit cards through Square. Checks are accepted for deposits only. We make it a point to be very transparent about our rates from the get go, so that our clients can spend their time focusing on their performances and not on the clock. *We don't have an hourly cap on our day rates. We believe that there is an appropriate time to call it a day, and it's different for each session. Some full day sessions will go 8 hours, and some may go 9, etc. Making records isn't necessarily a 9 to 5 endeavor, and we accommodate for this. If your session goes over more than we feel is financially acceptable, we'll let you know. In this case, we'll usually prorate you hourly for the extra time. We'll be sure to let you know before hand. There won't be any surprises. HOURLY RATES: Please contact us for hourly rental rates. Our rates may differ based what gear is required, and on the duration of your project. There is a 3 hour minimum for rental sessions. MOBILE SESSIONS: Fivethirteen can accommodate your mobile recording needs depending on the size of your project or event. We would be happy to come to you if you'd like. Keep in mind that our mobile rates vary from client to client due to the fact that we have to get to you wherever you are. Please contact us for more info. DEPOSITS: We require a 50% deposit for a project at least 10 days in advance for new clients. Checks are accepted for deposits, but must clear at least 10 days prior to the session date. CANCELLATIONS: In the event that you need to cancel a session, we ask that you give us 48 hours notice so that we can accommodate and reschedule. In the case that this doesn't happen, there will be a fee enforced and collected before rescheduling. ANY FEES PAID DUE TO A CANCELLED SESSION WILL BE CREDITED TOWARD YOUR RESCHEDULED SESSION. IF YOU ARE A NEW CLIENT, AND WERE REQUIRED TO MAKE A DEPOSIT FOR YOUR CANCELLED SESSION, YOUR DEPOSIT WILL BE CREDITED TOWARD YOUR RESCHEDULED SESSION.